The Republic of India, Asia's second-largest country after China, occupies the largest part of the South Asian subcontinent, which it shares with Pakistan, Nepal, Bhutan, and Bangladesh. 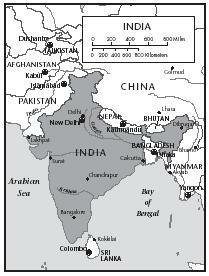 India's total area is 3.3 million square kilometers (1.3 million square miles). Among India's most serious environmental problems are land damage, water shortages, and air and water pollution (about 70 percent of India's water is polluted). Even in rural areas, the burning of wood, charcoal, and dung for fuel, coupled with dust from wind erosion during the dry season, creates an air pollution problem. 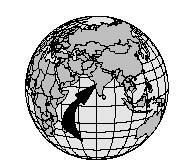 Rice, the largest crop, is grown wherever the conditions are suitable. Some of India's foods date back five thousand years. The Indus Valley peoples (who settled in what is now northern Pakistan) hunted turtles and alligator, as well as wild grains, herbs and plants. Many foods from the Indus period (c. 3000–1500 B.C.) remain common today. Some include wheat, barley, rice, tamarind, eggplant and cucumber. The Indus Valley peoples cooked with oils, ginger, salt, green peppers, and turmeric root, which would be dried and ground into an orange powder . Perhaps the biggest contributors to India's culinary heritage are the Muslim peoples from Persia and present-day Turkey, who began arriving in India after 1200. These peoples, known later as the Mughals, ruled much of India between 1500 and early 1800. They saw food as an art, and many Mughal dishes are cooked with as many as twenty-five spices, as well as rose water, cashews, raisins and almonds. Wash and cut eggplant and tomato into small cubes and finely chop onion and ginger. Heat the oil in a saucepan for 1 minute. Add the onion and ginger and fry over medium to high heat, stirring constantly, until golden brown. Add the turmeric, chili powder, salt, and garam masala to saucepan. Mix thoroughly. Add the eggplant and tomato to saucepan. Stir well and cover pan with lid. Reduce the heat to low and cook until the eggplant and tomato are soft, stirring occasionally to prevent vegetables from sticking to pan. After 20 minutes, remove the lid and continue to cook over low heat, stirring often, until liquid evaporates. The dish is ready when the ingredients are blended together as a thick puree. Serve with rice, whole wheat bread, or tortillas. Chapati, or Indian bread, is prepared throughout India. The woman in the picture on the left is working in a typical urban kitchen in the city of Ghaziabad. The woman on the right prepares chapati in a typical village kitchen in northern India. Store in an airtight container and add to recipes as needed. This style of preparation may be linked to the traditional use of cow dung. For centuries, families would cook by placing a pan on top of patties made from cow dung. Like the charcoal used in modern-day barbecues, dung initially produces a high heat, but then burns slowly. Although middle-class and urban Indians have electric or gas stoves, many rural households still use cow dung (waste). 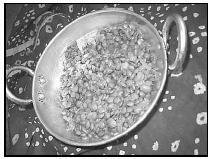 Dal, or spicy lentils, are shown here in a traditional serving dish. Dal is usually made with red lentils, but any lentils may be used. Rinse the lentils and combine them with the water in a large, heavy saucepan. Bring to a boil, cover, and simmer until the lentils are quite mushy, about 40 minutes. Heat the oil and skillet; sauté the onion and garlic over medium heat until golden. Cover and simmer over very low heat for 15 minutes. 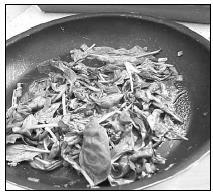 Wash the spinach well and remove stems. Finely chop the onion, garlic, and ginger. Heat the oil and butter in a saucepan over medium to high heat. Add the cumin seeds and fry for 30 seconds. Add the chopped onion and fry until golden, about 2 minutes. Next add the chopped garlic and ginger and fry for about 1 more minute. Add the ground cumin, coriander, turmeric, chili powder, and salt; mix well and add the spinach. Mix rapidly to coat with spicy mixture. Lower the heat to medium and add about ¼ cup water. Stir, cover with lid, and cook for about 5 minutes. Palak Bhaji (Spicy Fried Spinach) earns its name from several of the favorite spices of Indian cooks—garlic, ginger, cumin, coriander, turmeric, and chili powder. Prick each piece of chicken with a fork. Rub the pieces with salt and black pepper. In a separate bowl, combine the yogurt, ground turmeric, paprika, chili powder, garlic powder, salt, and garam masala. Mix well. Drop each piece of chicken into a bowl and coat with the yogurt mixture. Place the chicken in a glass baking dish and cover with plastic wrap; refrigerate for at least 1 hour. (The chicken can be refrigerated overnight). Preheat the oven to 350°F. Bake the chicken, uncovered, for about 30 to 40 minutes. (When pricked with a fork, the juice that runs out of the chicken should be clear.) When thoroughly cooked, place the chicken on a serving plate. Slice the lemon and squeeze the juice on top before serving. Top with the sliced onions if desired. Nearly every holiday in India requires a feast. The year's biggest festival is Diwali, which occurs in October or November. The actual date is set by the lunar calendar and varies from year to year. The festival's meaning varies by region and religious group. But some traditions are shared: old debts are paid off, homes are cleaned, new clothes are made or purchased, and an elab orate meal is prepared. On Diwali and other festive occasions, India's Mughal heritage takes center stage. The Mughals saw eating as an art and a pleasure. Courtly chefs prepared food that tasted good, and delighted the senses of smell, sight and touch. Many Mughal dishes call for meat, but vegetarians incorporate the spices and nuts that Mugal cooking made popular. In addition, many purchase sweets such as ladhu and barfi at local shops, and distribute them among their relatives and friends. Many of these sweets also date to Mughal times, and use ingredients such as besan (chickpea flour), paneer (a white cheese), rose water, almonds, and sugars. Many celebrate the start of spring with Holi. In the morning, people splash each other with colored water and smear one another with red, yellow, green, blue and orange powders. Many also drink bhang , a yogurt drink. After the festival, the old clothes are burned and halwa (a sweet dish made with wheat or rice flour, butter and sugar) is eaten. The day often ends with a feast and musical festivities. Halwa "cakes" are often served for breakfast on special occasions, such as birthdays. Tamatar Salat combines the cooling flavor of mint with the sharper flavors of tomatoes, onions, and lemon. Dice the tomatoes, finely slice the green onions, and chop the mint leaves. Toss together in a large bowl. In a small bowl, mix the lemon juice, salt and sugar together. 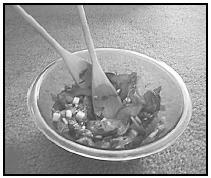 Pour the mixture over the tomatoes, onion and mint leaves. Squeeze the lemon juice into the blender. Place the cilantro, green chilies, and remaining lemon rind in a blender and grind into a paste. Heat the butter in a saucepan and add the cinnamon, ginger, and cloves, stirring for 30 seconds. Add the rice and stir until coated with butter, then remove from heat. Add the peas, the paste from the blender, salt, nuts, and 4 cups of water. Mix well and transfer the rice mixture to an earthen pot or glass baking dish. Cover and bake until rice is cooked, about 30 to 40 minutes. Wash the rice and soak in water for 30 minutes. Drain well. Boil the milk in a large pan. Lower the heat and add the rice and cardamom seeds. Simmer on low heat until mixture thickens to a pudding-like consistency, about 1½ to 2 hours. Stir every 5 to 10 minutes to prevent mixture from sticking to sides and bottom. When the mixture has thickened, remove from the heat. Let cool about 25 minutes, and then add the sugar and stir well. Add the raisins and almonds. Serve hot or cold. Indians eat several small meals a day. Many families begin the day at dawn with prayers. A light meal of chai (Indian tea) and a salty snack will follow. Breakfast usually takes place a couple of hours later, and may include a traditional Indian dish such as aloo paratha (a flatbread stuffed with potato and fried), or toast with eggs. Other popular breakfast dishes include halwa (made with ground wheat, butter, sugar and sliced almonds) or uppma, which is a spicier version of halwa. Students often eat a mid-morning snack, such as a banana with juice or tea, at school. Lunch usually includes one or two cooked vegetable dishes, rice and chapati (a flat-bread that resembles a Mexican tortilla). Many students carry their lunches from home in containers known as tiffins. Many students also eat sandwiches. An afternoon snack often is served around 5 or 6 P.M. It includes tea and namkeen (snacks or appetizers), and sometimes may involve a visit to a restaurant or street stall that sells spicy snacks such as samosa (a small turnover stuffed with potatoes and peas) or bhel puri (a combination of puffed rice, yogurt, tamarind sauce, and boiled potatoes) . In addition, fruits such as mango, pomegranate, grapes, and melon may be served. Dinner traditionally is served quite late, and includes two or three vegetable dishes along with rice and chapati . In many households, both adults and children take a cup of hot milk, flavored with sugar and a touch of cardamom before going to sleep. 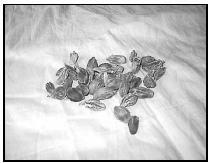 Black cardamom pods give chai (Indian tea) its distinctive flavor. A mother in a suburban kitchen near New Delhi prepares warm milk for her daughter. It is common for both adults and children to drink warm milk, flavored with sugar and cardamom, at bedtime. Place the teabag in a teacup or coffee mug. Add the milk, sugar, and cardamom pods. Pour the boiling water in a teacup or coffee mug, stirring with a spoon. Allow to steep for 2 to 3 minutes. Remove the teabag and serve. Place the 2 slices of bread on the counter and spread lightly with butter. Sprinkle the black pepper and salt lightly over the butter. Place the tomato or cucumber slices on 1 of the bread slices. Place the other slice on top and cut in half with a knife. In a large bowl, blend together the flour, salt, ajwain (or dried oregano) and black pepper. Add the oil and rub into the flour with fingers. Add water to the flour and continue mixing with fingers to create a smooth, flexible dough. With the thumb, index, and middle finger, break off pieces of the dough. Press until each piece is about ¼-inch thick. Prick each piece with a fork; let dry for 20 to 30 minutes. Heat the oil in deep-frying pan and drop the dough pieces into the oil and fry for about 3 minutes. Carefully remove from oil with a slotted spoon and drain on paper towels. About 22 percent of the population of India is classified as undernourished by the World Bank. This means they do not receive adequate nutrition in their diet. Of children under the age of five, about 53 percent are underweight, and more than 52 percent are stunted (short for their age). The government put into place a national system to distribute Vitamin A to children, which contributes to malnutrition and blindness. India is one of the few countries where men, on the average, live longer than women. To explain this, it has been suggested that daughters are more likely to be malnourished and be provided with fewer health care choices. In a society where sons are favored over daughters, female infanticide is a mounting problem. In addition, hundreds of thousands of children are living and working on the streets. Child prostitution is widespread. Special measures are being taken by the government to rehabilitate juvenile prostitutes and convicts to help remedy the growing problem. India's government has established an extensive social welfare system. Programs for children include supplementary nutrition for expectant mothers and for children under the age of seven, immunization and health programs, and prevocational training for adolescents. The government is also paying increasing attention to health, maternity, and childcare in rural India by sending out growing numbers of community health workers and doctors to areas in need. Achaya, K.T. Indian Food: A Historical Companion Delhi: Oxford University Press, 1994. Hospodar, Miriam Kasin. Heaven's Banquet: Vegetarian Cooking for Lifelong Health the Ayurveda Way E.P. Dutton, 1999. Jaffrey, Madhur. Madhur Jaffrey's Spice Kitchen. Carol Southern Books, 1993. Kirchner, Bharti. The Healthy Cuisine of India Lowell House, 1992. Lethaby, Jo, editor. Indian Food and Folklore . (Laurel Glen, 2000). Solomon, Charmaine. The Complete Asian Cookbook Charles E. Tuttle Co., 1992. Ruschikitchen.com. [Online] Available http://www.ruchikitchen.com (accessed March 4, 2001). Most ingredients for Indian foods are available at grocery stores. Health food stores and ethnic stores that specialize in Indian, Pakistani or Middle Eastern cuisine often have special ingredients such as garam masala and premixed tandoori masala pastes. Why the entire photos are colourless?...finding not interested..the recepies are limited..
Is turmeric and curry powder the same spice? Where is the recipe for chicken curry? Roti? chutneys?